Since we are developed Supplier, Exporter and Importer, we are actively engrossed in presenting a wide consignment of Wall Jib Cranes. This equipment is part of a range designed to both demonstrate and experimentally confirm basic engineering principles. Great care has been given to each item so as to provide wide experimental scope without unduly complicating or compromising the design. This is available in the market in very economic price. 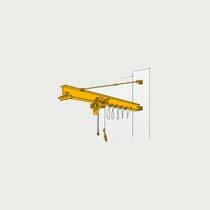 Wall-type jib crane is, I beam was equipped with a jib mechanism that pivots 180 degrees, is the crane of the wall fixed to be attached to the building of the pillars and walls. Rotation support part adopts a method of fixing the upper and lower brackets on the wall, and easily installed. The precision work we recommend a combination of a two-speed form hoisting machine. If you are installing such as concrete pillars, square pipe Column wall, it becomes the mounting hardware is necessary. Please consult separately.